Welcome to the January 2006 issue of the St. Kitts and Nevis Beach Buzz. For us here at Discover St. Kitts Nevis Beaches, the new year got off to a fast start. You will recall that in last month's newsletter I mentioned the January 19th forum members and friends link up that was planned. Well, the link up was a blast and everyone had fun. It was as if we were old friends getting together for a reunion, but for most persons, it was the first time we were meeting each other. To read some comments about the link up, visit the January Link Up thread in the forum. For link up photos, visit the January 19 Link Up photo album. To digress a bit, I had barely recovered from the link up when work took me off island. I was invited to the launch party of "Nevis as We See Her: Goin' to Come Back" by Rosemary Willis Sullivan and MaryJo Cannon at Cafe des Arts on the evening of Saturday January 21, but unfortunately I was unable to attend as I had to travel to Jamaica early Sunday morning. What a trip it was! After this trip, I can certainly write a chapter about air travel with LIAT :(. In a nutshell, LIAT cancelled the flight to Antigua, sent us to St. Maarten to connect to a flight bound for Antigua, which was delayed by about 1 hour and 15 minutes. By the time we arrived in Antigua, our BWIA flight to Jamaica was boarding (no hope for us to make that flight, since we had to clear immigration and customs, then go to the BWIA counter to check in). While we were in the immigration line, we heard over the PA system that the BWIA flight was closed. As that was the only flight out to Jamaica that day, missing the BWIA connection meant overnighting in Antigua, taking the BWIA flight on Monday, and missing all but one of the meetings scheduled for Monday. Unfortunately, we were not able to reschedule the missed meetings, two of which were crucial for me. Nonetheless, despite missing a number of key meetings, my brief trip to Jamaica was insightful. [PS - Read about our visit to Panmedia. (There is an error in the photo credit; I'm with the Ministry of Sustainable Development and not Education)]. Anyway getting back to where I was before the digression, January is over and I guess you may be wandering what's in store for February. Well, I'll continue to keep you updated on the happenings in St. Kitts and Nevis. There are a few pages on the site (such as the Ferry Schedule and Taxi Rates pages) that need updating and I'll try my best to make some time to update those. I'll also continue working with a local craft person whose beautiful hand crafted items are deserving of international exposure. Already I've photographed a wide selection of the items, and during this month, I'll be working on coding the pages to display the items on my web site. As usual, I will continue to add new content pages and photo albums, as time permits. 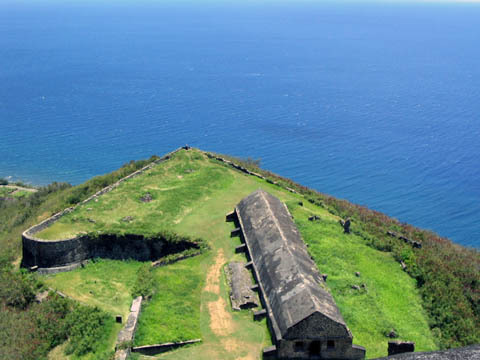 On the fun side, some forum members will be visiting St. Kitts and Nevis during February and they would like to link up with other forum members and friends who either live on the island or will be visiting. If you'll be in St. Kitts on Thursday February 9 or Thursday February 16, be sure to come on down to Mr X Shiggidy Shack at South Frigate Bay Beach from around 6pm. If you have trouble locating fellow forum members, stop by the bar and ask for fellow forum member Paula and let her know you are there for the forum link up, so she can point out where we're hanging out. Looking forward to meeting you at one of the forum link ups. That's all for now. Happy reading and viewing! 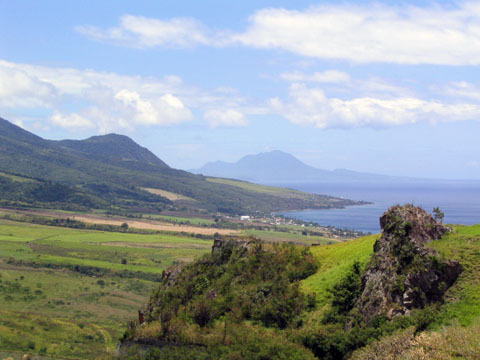 I've added another video clip to the Discover St. Kitts Nevis Beaches video archive. The new video clip is of George the Fire Man performing at Mr X Shiggidy Shack. Enjoy! Over the next few months, I'll be making some changes to the structure and layout of the Discover St. Kitts and Nevis Beaches website. These changes will simplify the process of making site-wide changes and updates. I do not anticipate any down time for the site as I will plan the work so as to minimize interruptions. Please bear with me as I make these important and necessary modifications to the site. Thank you for your continued support. Confirmed artistes for the 10th Anniversary of the St. Kitts Music Festival include Dionne Warwick, Morgan Heritage, Culture and local recording artist Crucial Bankie. The Caribbean Gift & Craft Show 2006 will be held at the St. Kitts Marriott Resort from September 14 - 17, 2006. The theme for this year's show is 'Excellence through innovation, creativity and strategic linkages'. Are you ready to take on the local scene? The operators of the Bob and Elvis Party Bus are daring you to go local with the Bob and Elvis Party Bus Bar Crawl with Dinner. The action gets started at 5:30 until Midnight on Tuesdays and Thursdays. The cost for the pub crawl in the air-conditioned party bus with on board bar and musical entertainment plus dinner at a popular local restaurant is US$70 per person. If you have a group who is interested in the Bob and Elvis Party Bus Bar Crawl with Dinner, be sure to ask about their group rate. For bookings call 869-466-8110 or 869-662-7848 or complete the enquiry form. 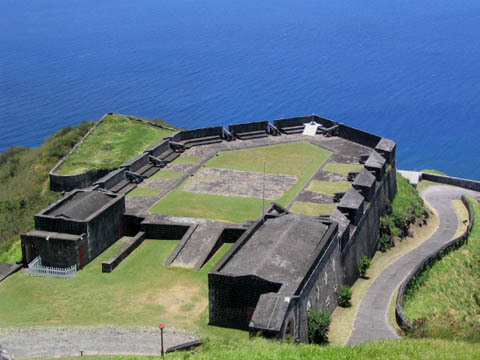 The Brimstone Hill Fortress, once known as the "Gibraltar of the West Indies", was designed by British Army Engineers and built by African Slave workers over a period of about one hundred years between the 1690s and 1790s. 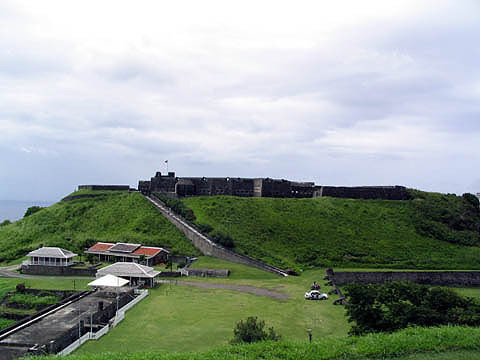 The Fortress was designated as a National Park in 1987 with the passage of the National Conservation and Environmental Protection Act. 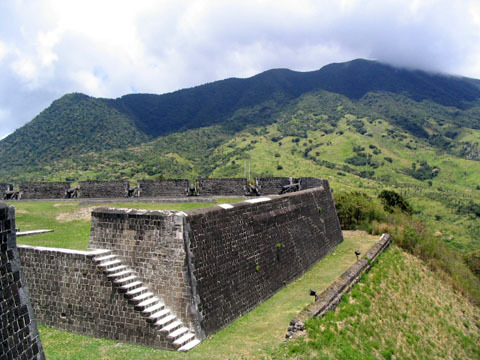 In 1999, the Brimstone Hill Fortress National Park was inscribed as a UNESCO World Heritage Site. The Inscription Ceremony was held in October 2000. Photos open in new window. View of the restored building housing the Canteen and restrooms, Parade Ground, ruin of the Artillery Officers Quarters off to the right and Monkey Hill in the distance. View of the Parade Ground which serves as the main parking area with Infantry Officers Quarters, Canteen, Warrant Officers Quarters and Visitors Center off to the left. 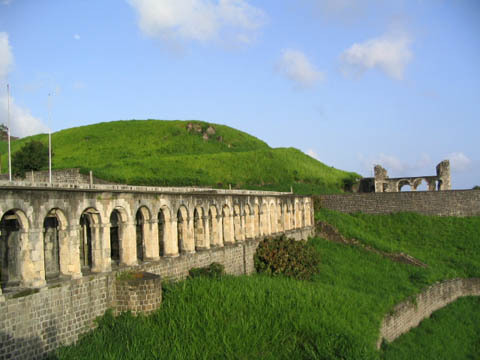 In the background is the Citadel and the ramp leading to it. Restored Warrant Officers Quarters situated opposite the Visitors Centre where the Orientation Room and Gift Shop are housed. The Infantry Officers Quarters to the left was originally a two storey building. The ruin of the Artillery Officers Quarters in the distance was said to be the finest residence of the Fortress. 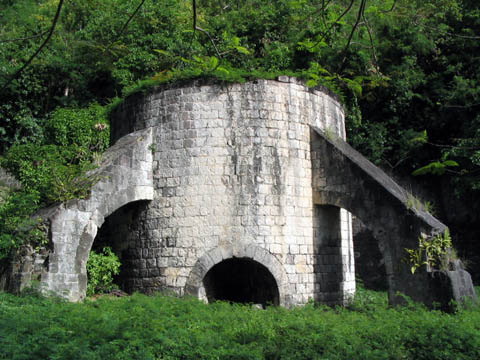 The Lime Kiln played an important role in the construction of the Fortress. The Main Ordnance Store in the Orillon Bastion. Some of the walls of the Main Ordnance Store are six feet thick. 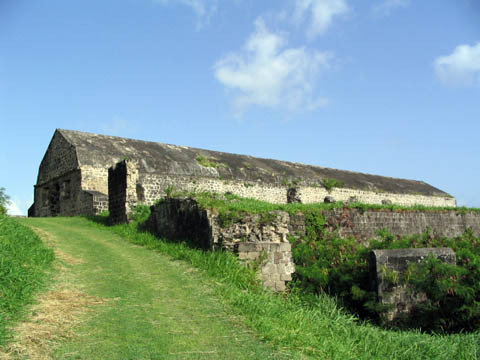 The Prince of Wales Bastion which housed the Brigade Office, the Main Guard Barracks and a Powder Magazine. It now hosts a conference / banquet facility that is ideal for events such as weddings. A section of the Orillon Bastion is visible off to the left front section. 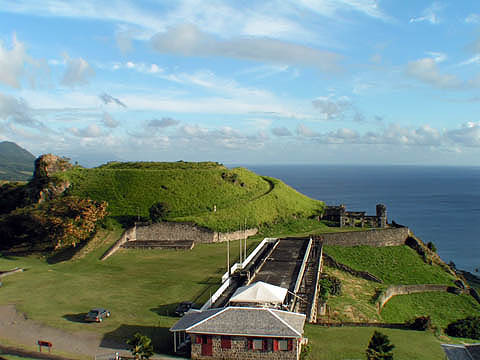 Another view of the Prince of Wales Bastion, where there is a telescope that can be used for whale watching as well as to view the coast, Sandy Point, neighbouring islands and the ruins of Fort Charles. The Orillon Bastion was once the site for the hospital. There is a cemetery located in the lower section, where a number of tombstones are still visible. Cannon placement in the Prince of Wales Bastion. 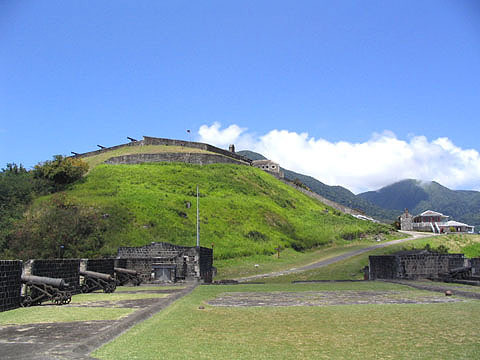 The Infantry Officers Quarters, the ruin of the Artillery Officers Quarters and Monkey Hill are visible in the background. 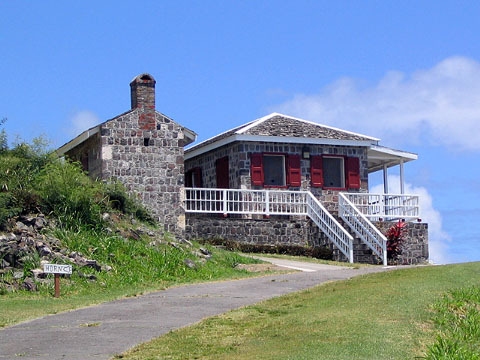 The Citadel at Brimstone Hill offers panoramic views of the mountains, Caribbean Sea, Sandy Point and neighbouring islands. 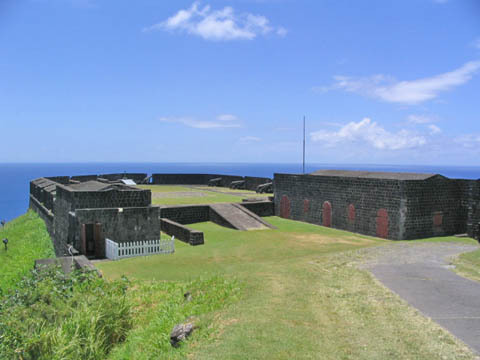 The lower level of the Citadel houses the Fort George Museum in restored barrack rooms The Eastern Place of Arms where the canons point toward the mountains. A view of the Town of Sandy Point and neighbouring islands from the Western Place of Arms. 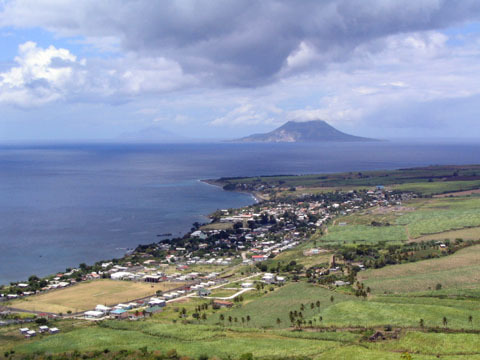 The closest island is St. Eustatius (Statia) while the barley visible outline of the peaks to the left of Statia is Saba. 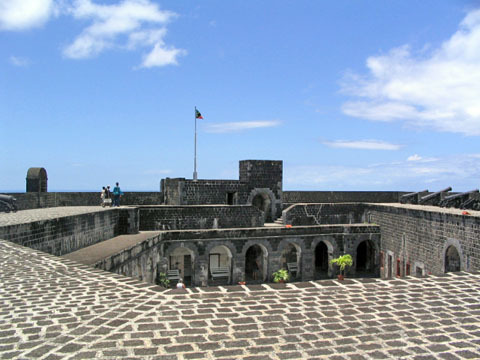 The Western Place of Arms with three canons overlooking the Caribbean Sea at the top of the ramp leading to the Citadel. The building off to the right is the restored Warrant Officers Quarters. 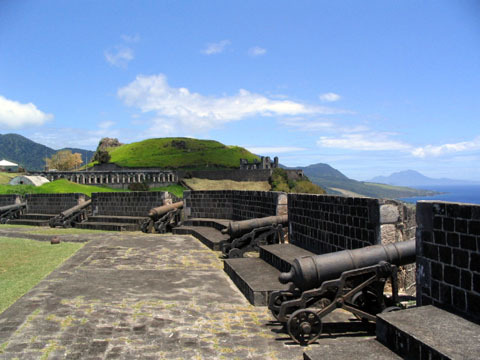 Three cannons in the Prince of Wales Bastion are in the foreground. Looking towards Nevis from the Eastern Place of Arms. "I found this website to be extremely useful and interesting. Thank you to all that work on it. We will be in St. Kitts tomorrow (from cold, dark Ohio in the U.S.) for our fourth visit and are very excited to be going back again. Thanks again for all the great info, photos, and updates on all the beaches, restaurants, etc." "Thank you for this site..it was very informative." 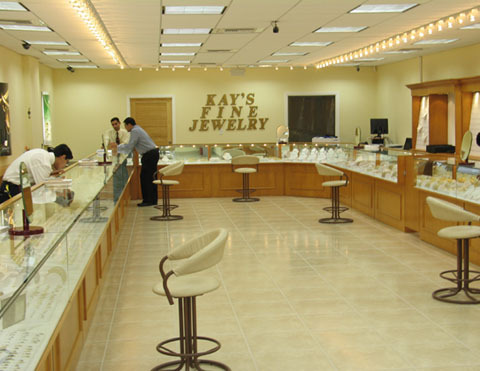 Fellow Discover St Kitts Nevis Beaches Travel Forum member Vick (SKBHOKIE) of Kays Fine Jewelry at Port Zante has graciously offered to give forum members an additional 10% discount on top of the 50% that he regularly gives. So next time you come to St. Kitts, remember to stop by Kays Fine Jewelry at Port Zante and ask for Vick. Donate to Discover St. Kitts Nevis Beaches. (Please note that I use PayPal to accept online donations so you will be taken to the secure Paypal website where you can enter the details of your donation. Please note that you do not need to have a PayPal account to donate). Alternatively, you can make a donation by going to the homepage on my website and clicking on the donation button at the top of the right column of the page. This will take you to a PayPal page where you can enter the details of your donation.